-Shoulder is the commonest joint in the human body to dislocate. -It occurs more commonly in adults. -Anterior dislocation is much more common than posterior dislocation. 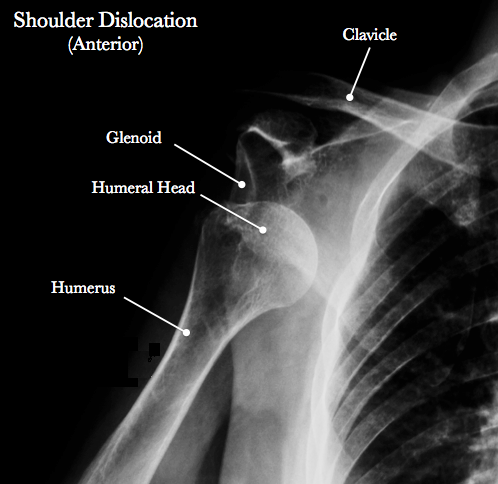 -Shoulder instability: head of the humerus is not stable in the glenoid. -A fall on an outstretched hand with the shoulder abducted and externally rotated, is the most common mechanism of injury. -Occasionally, it results from a direct force pushing the humerus head out of the glenoid cavity. 1.a direct blow on the front of the shoulder, driving the head backwards. 2.More commonly as a consequence of an electric shock or an epileptiform convulsion. head of the humerus comes out of the glenoid cavity and lies anteriorly. -Dislocation causes stripping of the glenoidal labrum along with the periosteum from the anterior surface of the glenoid and scapular neck. -The head comes to lie in front of the scapular neck, in the pouch thereby created. -In severe injuries, it may be avulsion of a piece of bone from anteroinferior glenoid rim, called bony Bankart lesion. -caused by impingement by the anterior edge of the glenoid on the head as it dislocates. Occurs in chronic cases as the head dislocates repeatedly over it. -There is a history of a fall on an outstretched hand followed by pain and inability to move the shoulder. -The normal round contour of the shoulder joint is lost, and it becomes flattened. -On careful inspection, one may notice fullness below the clavicle due to the displaced head. This can be felt by rotating the arm. 1.Dugas’ test: Inability to touch the opposite shoulder. -Because of the flattening of the shoulder, it is possible to place a ruler on the lateral side of the arm that touches the acromion and lateral condyle of the humems simultaneously. -An axillary view is sometimes required. -usually occurs following a convulsion. -CT scan may be diagnostic. -reduction under sedation or general anaesthesia, followed by immobilisation of the shoulder in a chestarm bandage for three weeks. -After the bandage is removed, shoulder exercises are begun. This is the most commonly used method. 3.the arm is rotated internally so that the. hand falls across to the opposite shoulder. -surgeon applies a firm and steady pull on the semiabducted arm. -He keeps his foot in the axilla against the chest wall. -The head of the humerus is levered back into position using the foot as a fulcrum. -result in paralysis of the deltoid muscle. -result in a small area of anaesthesia over the lateral aspect of the shoulder. -result in inability to abduct the shoulder. Treatment is conservative, and the prognosis is good. -Shoulder is the commonest joint to undergo recurrent dislocation. -It prevents external rotation and abduction, thereby preventing recurrences. -glenoid labrum and capsule are reattached to the front of the glenoid rim. -In this operation, the coracoid process, along with its attached muscles, is osteotomized at its base and fixed to lower half of the anterior margin of the glenoid. -The muscles attached to the coracoid provide a dynamic anterior support to the head of the humerus.